Caitanya Mahaprabhu after taking His lunch would rest for a while and Govinda was daily massaging His feet. 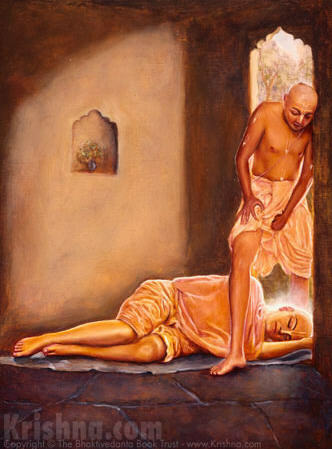 So one day Caitanya Mahaprabhu fell asleep very soon and keeping His head on the threshold. While He was sleeping, Govinda came crossing the body of Caitanya and massaged His Feet. But he was sitting there, so when Caitanya Mahaprabhu was awake He saw that Govinda was sitting there although it was too late.